Avocado - this originally Central American and Carribean fruit has a high level of the good monounsaturated fats, useful potassium and healthy fibre. 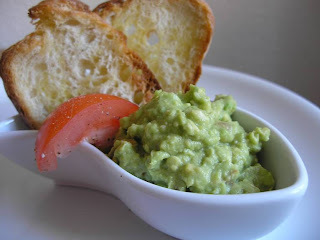 Guacamole is an easy and wonderful dish to be enjoyed in many occasions. Deseed the tomato and cut into small cubes. Deseed the chilli and chop very finely. Cut the avocado in two halves and scoop the flesh out into a bowl. Add the lime juice and with a fork form a smooth mash. Add the onion, tomato and chilli to the avocado and mix adding salt to your taste. Serve with tortilla chips or with thin crusty bread like I did. Cut a few (8-10) thin slices of baguette type bread or any bread you wish. Place them on an oven pan on the baking paper. Drizzle a little olive oil on the slices and cook for 5-10 minutes in the oven at 200C till a brownish crust appears. If you can´t serve the guacamole immediately drop the avocado stone back into the mash. This will keep it green rather than turning brownish. Avocado goes well with shrimp too.